Archangel means "first messenger." In Greek it is "archaggelos. Arch means first and aggelos means messenger. Angels are not humans, but are spirits. Gabriel, who announced the Good News to Mary, means "the power of God." 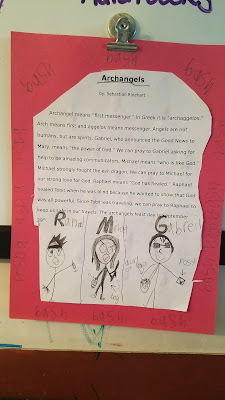 We can pray to Gabriel asking for help to be amazing communicators. Michael means "one who is like God." Michael strongly fought the evil dragon. We can pray to Michael for our strong love for God. Raphael means "God has healed." Raphael healed Tobit when he was blind because he wanted to show that God was all powerful. Since Tobit was traveling, we can pray to Raphael to keep us safe in our travels. The archangels feast day is September 29th.